More Obama Musical Speech Mash-Ups! Hey, look. It's another one of those Obama speeches flanked by music and enhanced by the magic of grayscale. This one, produced by Tom Dunlap and seeded by Feed Company, is called "Hope Changes Everything." 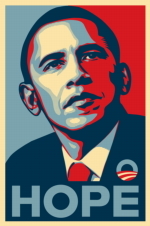 See the previous Obama-rama pop effort, "Yes We Can." Think all the jingling will distract from the "iconic phrase" ripping?